A comfortable work space mixes personality and functionality for an inviting, inspiring feel. When you’d rather work at your dining room table than in your home office, it’s time to rethink your work space. That was the case for a pharmaceutical executive in North Andover, who hired designer Eric Haydel to transform her dark paneled 1980s-era office from uninviting to inspiring. 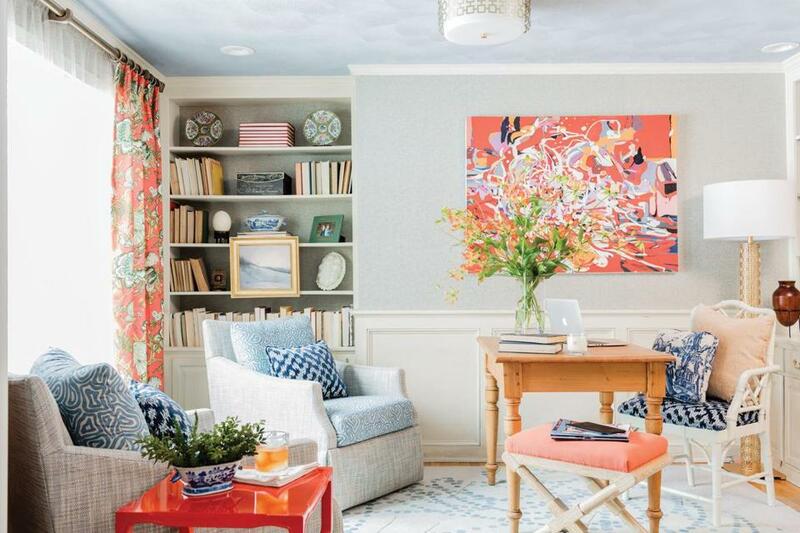 After clearing out the room, Haydel lightened the palette and added bright accents and fabrics. “I wanted the room to feel natural and have some very useful, practical elements while not looking too ‘officey,’ ” says the Boston-based designer. Not only does his client now use the room daily, but her children, ages 10 and 12, also like to do their homework in its sitting area. Regular use proves the redesigned space fits the family’s lifestyle and reflects its owner’s tastes, and Haydel says that’s when he knows his work is done. 1. Haydel surprised his client by keeping the built-in bookcase and wainscot, but he sanded the existing dark woodwork and had it covered with Annie Sloan Chalk Paint in Old White to reflect the home’s French Provincial design influence. 3. A bright oil painting by Way O’Malley gives the office verve. “A space needs multiple emotions, and this artwork has crazy movement and great energy,” says Haydel. 4. The recessed ceiling lights weren’t cutting it for desk work and reading. Haydel’s solution: adding a floor lamp and hanging ceiling light, both with an open metal design. 5. The client chose a Carnival Collection “Masquerade” rug that Haydel had designed for Dover Rug & Home; its golden brown, blue, and white tones mirror colors in the room. 6. With its shiny finish and saturated color, a bright orange lacquer side table brings energy to the room and complements the desk’s warm yellow tone. Haydel likes to include one lacquer piece in each room. 7. A large window lets in brilliant afternoon sunshine. Light sheers and heavy curtains offer two options for controlling the light. 8. Haydel added personality to the bookcases with collectibles from the homeowner’s world travels, family antiques, and books for leisure time. 9. The swivel chairs are upholstered in an Osborne & Little fabric that echoes the wallpaper’s tweedy texture and reflects the home’s traditional style. 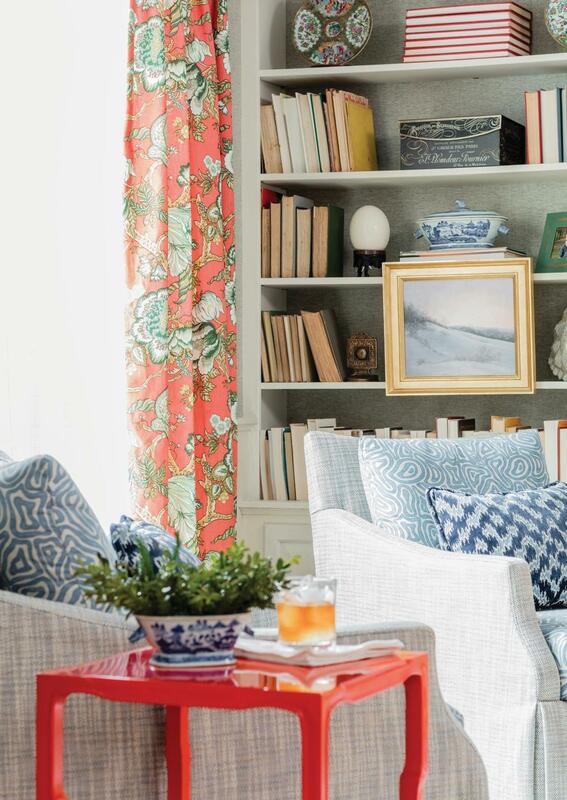 Haydel added depth by layering them with cushions and pillows in different blue patterns.